New Leeds United head coach Uwe Rosler. It may not have been handled to every fan’s liking, but at last Leeds United have resolved the head coach issue and can now get on with planning for next season. Uwe Rosler suddenly emerged as the man owner Massimo Cellino wanted to take the Whites on and he was unveiled at a press conference at Elland Road, having signed a two-year deal. 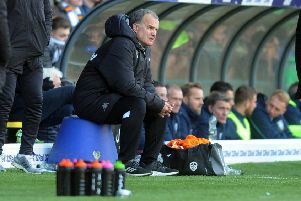 There has been speculation that he was third choice to take over from Neil Redfearn, behind Mark Warburton and Gus Poyet, but the German has some of the credentials to do the job with more success than Cellino’s first two appointments last year and knows English football having played for three clubs over here and managed two more. Rosler certainly talked a good game at his unveiling. He spoke about the way he likes his teams to play football and how he wants everyone to pull in the same direction. He targeted a top 10 finish in his first season and was not planning a big overhaul of a squad that looked to be taking shape after a tough start to last term. He said: “I think the key ingredient is the right expectation, setting the right level of targets and creating chemistry between the staff and the players and also between the supporters where everybody is driving in one direction. “When your expectations are too high, sometimes teams get nervous and show problems like losing their confidence. “I think you can achieve a lot with hard work and being clever in the transfer market. You don’t need the biggest budget. Despite becoming the fifth first team boss in 12 months at Leeds, Rosler reckons he can work with Cellino and will not be affected by the pressure that goes with this job. He said: “I’m not suicidal. If I didn’t see a chance to be successful with this club then I wouldn’t have taken that chance. “I had other opportunities, but I chose this one because it was Leeds United. The owner is very passionate and I have passion. We all want to do the best for this club. “He’s a very knowledgeable football man. I showed him a presentation of my style of play and we discussed a lot of football. He has got a pretty good idea of what I’m looking for in terms of recruitment. “I thrive on pressure. “I think it’s very important for the job I’m working in to accept that there’s pressure around you and use it in the best possible way. “The chairman made it clear to me that he wants the next building block. The foundation was laid down with the nucleus of the team. “There will be no big overhaul – not 10 or 15 new players. The nucleus of the team will stay. We will bring some new players in but not many. “I think this group of players deserve to get to the next level and hopefully I as a coach and my coaching team can help them. “The expectation for me is that I want to win every game. I know this is not possible but we will always be looking to get more points on the table. I think we need to develop the players individually and collectively. For me personally, top 10 would be the level to aim for at first. June 17: Publication of fixtures. August 8/9: Football League season kicks-off. W/c August 10: Capital One Cup round 1. W/c August 31: Football League Trophy round 1. December 26, 28 and January 2: Festive fixture programme. February 28: Capital One Cup final. April 3: Football League Trophy final. May 7/8: Sky Bet Football League season concludes. May 28: Sky Bet Championship Play-Off final. May 29: Sky Bet League 1 Play-Off final. May 30: Sky Bet League 2 Play-Off final. Season tickets for the 2015-16 campaign are available now and existing holders have until Saturday (May 30) to secure their current seat and take advantage of the frozen renewal prices.